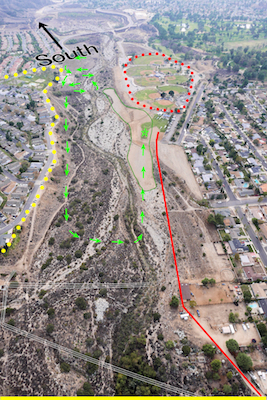 These aerial photographs show the Sylmar Flight Park and surrounding areas, looking south. 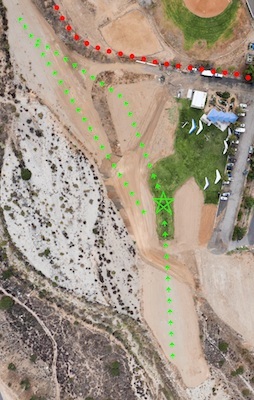 The landing zones are outlined in green, with the "target" shown as a pentagram at the center of the grass runway for ALL PILOTS. Overshoot areas shown as small green arrows beyond the pentagram target and into the wash on the left. Please do not land in the baseball field parking lot. The landing pattern should be a left-hand "aircraft" type approach as shown by the large green arrows. No part of any landing approach may cross to the west (right) of the 200-foot line, shown as a solid red line, and marked with traffic cones on the field. "S" turns are discouraged, as they may lead to a loss of control and could cause conflicts with others in the landing pattern. 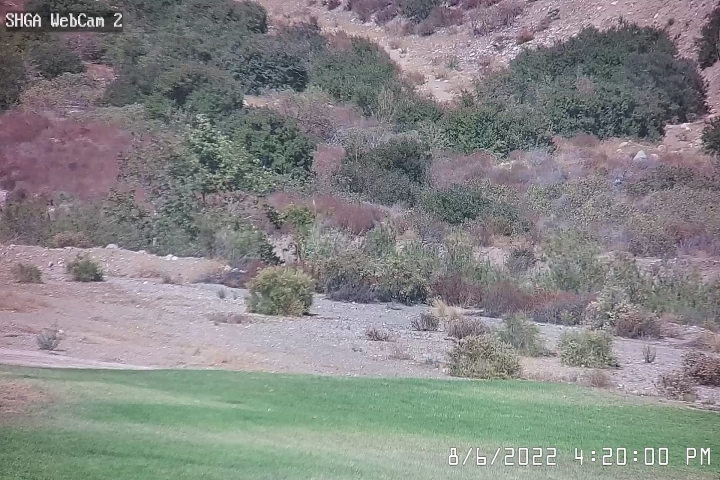 The dotted red area is the Sylmar Independent Baseball League (SIBL), and one must not fly over this area when games are in session, nor land there, if the target LZ is missed. The solid yellow line at the bottom of the larger area picture is the Gavina St. bridge (just out of the picture). Pilots must be less than 3,000 ft. MSL before crossing this street and proceeding to the landing zone. The subdivision marked by the dotted yellow area is Santiago Estates; pilots may fly over these homes. Note that there are two sets of power lines between Gavina Street and the LZ. Flying over any other residential areas is strictly prohibited.